Protect your business and your workers! Our certified professionals provide the full range of Health, Safety, & Environmental consultation services to support, encourage, and improve regulatory compliance in any type of business. All Risk compliance our software programs cover the entire Quality, Health, Safety, & Environmental spectrums, and come either out-of-the-box or customised to your requirements. We cover all your risk compliance needs from general compliance support over the phone or email to procedural development, incident investigation, rehabilitation, and training. Are you using Excel spreadsheets and Word documents to monitor and maintain your facilities and other assets? Are you looking for the latest Computerised Maintenance Management System (CMMS) or Enterprise Asset Management (EAM) software? Contact us today to find out how we can help you find the right Facilities Management Software solution for your business. MiSAFE is partnered with multiple asset management software providers. We make the process of finding the right facilities management software program easy and affordable, so you can start seeing a return on your investment sooner. Whether you are using Excel spreadsheets, Word documents or another software program, we gather all of this current information and tailor a solution that meets your requirements for a solution that is robust and scalable. MiSAFE provides facility management software programs that comply with ISO 41001:2018 – Facility management – Management systems, ISO 9001:2015, ISO 45001:2018, ISO 14001:2015. Track all of your facilities and assets in the cloud. The software we provide allows you to create a systematic structure of your assets that matches the physical location of the assets you maintain in the real world, this allows you to easily locate and maintain them when you arrive on site. This also allows you to comply with national and international regulatory requirements. Planned automated maintenance is the key to staying on top when it comes to facility and asset management. Automatically generate task-based work orders for assets based on location and required maintenance frequency. Act promptly when assets breakdown, but preventative maintenance is the goal. Our asset management software allows you to create conditions and event-based rules to automate your operations. The systems also have extensive functions such as the ability for the company to automatically notify nominated personnel when an asset fails, to setting an asset to inactive when a parameter is updated. Complete asset management tasks in-field without needing to be connected to the internet. The data entered by the user simply synchronises when the device comes back online. Our facility and asset management software solutions can do anything including status or ID changes in the field, moving assets from one site to another, and creating a new asset. Some of the features of the facility management software solutions we provide include the ability to view asset tasks by focusing on one asset, searching by individual ID codes, barcodes etc., or by asset type (i.e. all fire extinguishers), or task type (i.e. perform re-gas). You can also easily add more tasks in-field as they arise. As always, when completing one task, another one comes up. Generally, that costs more money, and in most cases can’t be fixed straight away. This is why our asset management software allows you to create rectification tasks with priority allocations, and quote generating functionality. Whatever it is you need, our asset management software can manage it with ease. Use permissions-based portals to provide your workgroups and customers with visibility of assets under their responsibility or ownership, including status, location and maintenance history. Our facility management software systems allow you to use their API’s, and write custom integrations with any 3rd party enterprise software solutions to either push asset data into the asset management software or pull it out in real time. With MiSAFE one of the main benefits is that you can get all of your systems under control and brought into a single perfect solution. 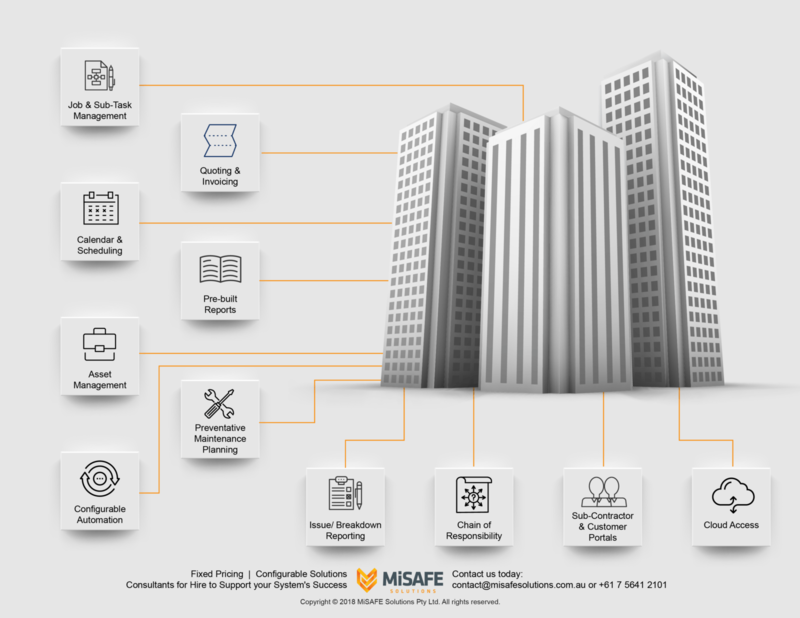 With experience in setting up facility management software and compliance software, MiSAFE can give you the solution that you need every time. Contact us today to find out how we can streamline your asset management systems. To make an enquiry or book a service from us, complete the form below and we will be in touch with you.